Seventy-nine percent of smartphone owners check their devices within fifteen minutes of waking up. Industry experts believe that we check our phones around 150 times per day! How did we get here? How is it that some apps can control the minds of their consumers? What makes these products addictive? Nir Eyal‘s Hooked: How to Build Habit-Forming Products is a critical work in the increasingly important field of psychological marketing, particularly as it applies to the customer experience. The field of coercion is not particularly new, but what is troubling is that designers of so many of our familiar products are manipulating us in ways we have barely started understanding. They test our habits, and worse, actually nurture and create them. [Virtual reality, anyone?] They even mess with our moods. Practical insights to create habits that stick. Actionable steps for building products people love and can’t put down. Behavioral techniques used by Twitter, Instagram, Pinterest, and others. The “first to mind” solution wins. 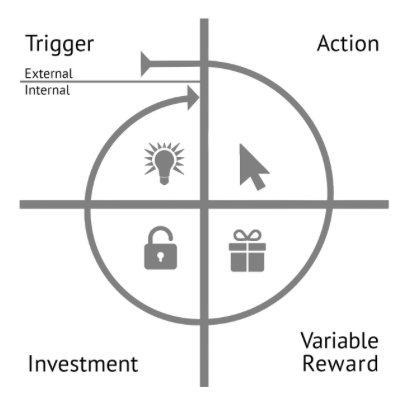 The author describes the process of building a habit-driven strategy as the Hook Model. To increase the odds of a user taking the intended action, the behavior designer makes the action as easy as possible, while simultaneously boosting the user’s motivation. An action that improves the service for the next go-around. Inviting friends, stating preferences, building virtual assets, and learning to use new features are all commitments that improve the service for the user. As a marketer, this book is a “must-read.” Read it alongside Sprint. What problems are users turning to your product to solve? And, to his credit, the author does make a genuine effort to discuss the ethical dimensions behind this manipulation, with a section in the book titled “The Morality of Manipulation.” He asks the question point-blank: What responsibility do product makers have when creating user habits? As a sidenote, I feel taking a moment to acknowledge Big Tobacco, the sugar lobby, and the beverage industries as yesterday’s champions. The future belongs to our digital addictions, and those who control them. Eyal has also written a post on addict behavior change that may be instructive, should you find yourself a bit carried away. Jenny Cheung is a freelance marketer and project manager based in Texas.